DESCRIPTION Wall or ceiling fixture providing diffused ambient light as well as a soft glow through its curved hand-blown Murano glass diffuser. Larger models, SELIS 35 and SELIS 45, are not ADA compliant. Companion pendant version also available. 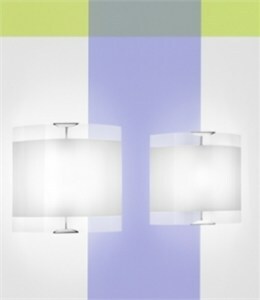 CONSTRUCTION Chrome metal mounting brackets support the hand-blown Murano glass diffuser. Backplate mounts directly to standard junction box. LIGHT SOURCE SELIS wall configuration can be fitted with three light sources: 1 x 200 watts, quartz halogen, recessed single contact (provided). 1 x 100 watts, incandescent, A-19, medium base (provided). 2 x 13 watts, compact fluorescent, recessed contact (not provided). FINISHES Mounting brackets: Chrome. Optional 24K Gold Plate brackets also available. NET WEIGHT Satin White, Satin Amber. 5 lbs.